School district All Columbus Csd 2503 Fra Co. Dublin Csd 2513 Fra Co. Hilliard Csd 2510 Fra Co. Worthington Csd 2516 Fra Co.
Dublin, Ohio, is an interesting city because it’s based in three counties: Union, Franklin, and Delaware. It’s also the namesake of Dublin, the capital of Ireland. Residents here place a high value on education because over 74 percent of adults hold a college degree. This small town of over 45,000 residents is a suburb of Columbus. If you need to go to the city for work or any other reasons, you only need to travel about 20 miles by car or bus. Since Dublin is named after Ireland’s capital, residents honor their community’s Irish roots with the Dublin Irish Festival. This festival is one of the largest Irish festivals in the United States because it attracts over 100,000 visitors every year. It begins during the first weekend of August and features Celtic music, food, and beverages, arts and crafts, kids’ activities, games, among other fun activities. Check out the Dublin Community Recreation Center. It offers all sorts of activities like sports leagues, camps, fitness classes, a theater and more. Ballantrae Community Park is a great place to take children to cool off. Besides a spray fountain, this park also has sculptures of dancing rabbits called the Dancing Hares. Another park worth visiting is Indian Run Falls Park. The park used to be home to the Wyandot Tribe. Its waterfalls and walking path make this park tranquil and soothing; therefore, it’s a nice place in which to temporarily escape from life’s stresses. Dublin offers a fine assortment of educational facilities: 13 public elementary schools, four public middle schools, three public high schools, a private daycare center and a Catholic school. If you want to ameliorate your education, you can enroll into one of its five post-secondary schools. Nearly 68 percent of real estate properties in Dublin are single family residences with the rest being multi-family homes and mobile homes. Most Dublin homes were constructed during the mid/late 20th century. Over 46 percent of residences here have four bedrooms. Think about buying your new home in this city. Not only is it safe and close to many things you need, it also possesses a nice Irish flavor. 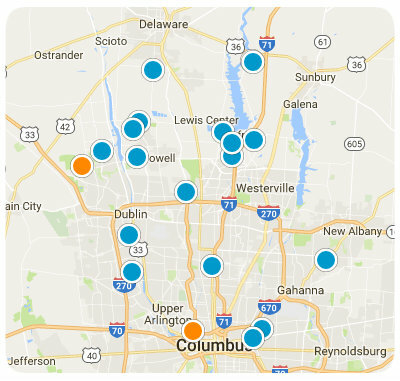 If you would like to know more about homes for sale in Dublin, Ohio, don’t hesitate to seek our assistance.